Scotland extended their home record to four victories over Ireland in the Marine Harvest shinty-hurling international series with an 18-15 success at Inverness's Bught Park. Once again, Kevin Bartlett with 12 points, including one of the game's two goals, was Scotland's top scorer in the composite rules fixture which Ireland led for periods in each 40 minute half. With just four minutes gone, Tipperary's John McGrath gave Ireland the lead with the first of the game's many single point hits over the bar. Bartlett, who returned to Caberfeidh from Lovat at the beginning of the season, soon equalised but Conor Lehane, Andy O'Brien and David Reidy tipped the balance 4-1 to the visitors. Steven MacDonald (Newtonmore) pulled back a two-point free hit from a dead ball before Bartlett gave Scotland a 5-4 lead with another of the same, which have been his international hallmarks. Ireland, meanwhile, saw several efforts fade past the post and also looked the more likely to score a three-point goal. However, they were denied by some great saves from Lovat's Stuart MacDonald, including a point-blank effort from Ross King. Five minutes before half time, Bartlett grabbed his three-pointer from close range after some fine work down the left by John MacRae, before Wexford's Lee Chin narrowed the half-time score to 8-5. Scotland re-emerged with all guns firing, forcing Irish keeper Enda Rowland into two fine saves in the opening minute. But it was the Irish who surged back in front when a two-pointer from McGrath among two singles from Cork's Lehane and one from David Reidy of Limerick took it to 11-8 just after the hour. However, the next 10 minutes clinched the game for Scotland. Bartlett got three more of the two-pointers which the Irish had appeared to be learning to deny their opponents. Kyles' Roddy MacDonald scored Scotland's second goal and Finlay MacRae (Kinlochshiel) grabbed a captain's point. Meanwhile, the only Irish response was single points from Chin and Lehane as Scotland built an 18-13 advantage. With a minute to go, MacDonald pulled off another great save which may have denied the Irish a draw because Ben Conroy of Laois, with the last hit of the ball in stoppage time, took the final score to within three. In the Under-21 game Ireland, with 12 points from Patrick Curran, prevailed 19-15 after Scotland, whose captain Arran MacPhee got two goals, led 10-7 at half time. 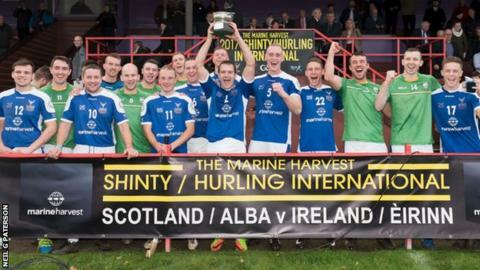 The previous evening Kinlochshiel, described by Camanachd Association President Jim Barr as having "made shinty history" with their first ever Premiership title, were named Club of the Year at the annual Marine Harvest Shinty Awards. The coach award went to James Perlich whose Kyles side won the MacAulay and Celtic Society Cups and finished second in the league. Kyles defender Andrew King was named the game's top player. Shiel's Johnston Gill became the Premiership Coach of the Year and the Marine Harvest Centenary Award, presented every three years for outstanding service, went to Donald Skinner of Glasgow.